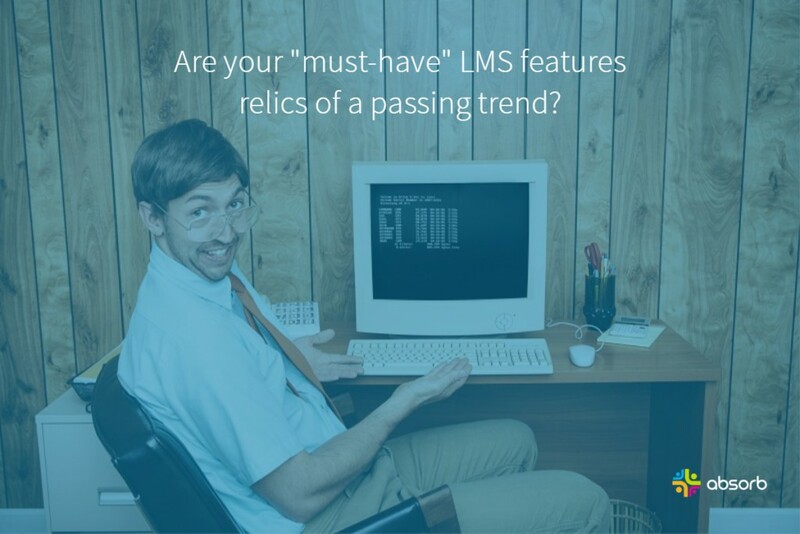 Make sure your team is buying an LMS for the year you’re in. About a decade ago, many organizations shunned cloud-based software and demanded that the LMS be installed on their internal servers. Now, even the most security-conscious organizations such as governments and financial institutions embrace software as a service (SaaS). In fact, opinion regarding the security of cloud-based applications seems to have jumped the shark, with many tech-savvy clients believing that cloud-based applications hosted on reputable platforms such as Amazon Web Services may lessen the risk of data falling into the wrong hands or disappearing. As an added benefit, new features regularly and magically appear in the LMS without the need for Jim in IT to load CD-ROMs onto a server every couple of months. Installed software was hot. Now it’s viewed as passé. Just as driving to the video rental store to get a movie has been replaced with Netflix, Hulu, Amazon, and other streaming movie providers, business software now resides firmly in the cloud. Fifteen years ago, learning professionals were obsessed with the idea of re-usable, Lego-block type nuggets of learning content. Each nugget would be stored as an object in a massive database. You’d then assemble the nuggets into some kind of order and publish the result in various formats including print, a teacher’s guide, a self-paced course, etc. Like storing your favorite dinner recipes on hand-written, color-coded index cards, managing learning content this way sounds like a good idea. Unfortunately, it’s a heck of a lot of work and no one seems to have time for this approach to content development anymore. During the peak of the LCMS craze, people used to often demand that their LMS also have LCMS capabilities. That’s gone. They still want to be able to create courses within their LMS but clients are overwhelmingly happy to do this by uploading videos, documents, etc. the same way you manage documents on your own computer. The need for learning management systems to have self-contained blogs and wikis has faded away. Learning administrators seem to have collectively come to terms with the reality that there are great, feature-rich blog and wiki applications on the web that they can use as part of collaborative learning experiences and that there’s no need to have these features built into the LMS. No LMS on the market contains blog and wiki features that can compete feature-by-feature against popular products such as WordPress and Mediawiki. So it makes much more sense to link to, or embed within a course, external blog and wiki content instead of demanding that blogs and wikis be part of the LMS feature set. A few years ago, organizations were obsessed with finding an LMS that would be able to tell them whether a physical classroom contained a projector, a whiteboard, a coffee machine, etc. Since then, projectors have shrunk from behemoth-size contraptions that needed to be rolled down a corridor on a gurney, like a patient on the way to the operating room. Now, projectors are tiny little machines that can fit in a shoulder bag. So, if a room doesn’t have a projector, it’s pretty easy to carry one into the venue. Clients still want the LMS to manage maximum attendance and wait-listing for each venue, but it’s pretty rare to see “management of classroom resources such as projectors” on a LMS requirements list. If it does show up, the organization is likely using an RFP template from the disco era. So what features should you look for in your LMS?